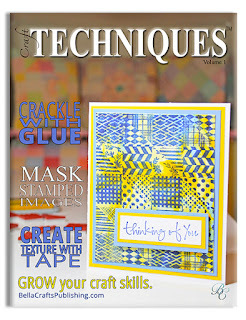 Don't have a lot of time to read them, but just bought an issue of Bella Crafts Publishing Craft Techniques e-mag. It's in .pdf format, and if you've used a .pdf viewer (like free Adobe Acrobat), you know it's easy to turn pages and navigate. I like Bella Crafts e-mags because they are very colorful, and show quick techniques and projects that are easy to follow. Of course, the main electronic publication, Bella Crafts Quarterly, is totally free. Because of this, anything that you buy from them is a great bargain. To get access to the quarterlies, you just sign on at the site via email address. They're on Linkedin, Twitter and Facebook.